This is a picture of Ray’s room. Click on the photos for links to Flickr complete with notes explaining the bizarreness of it all. Ray is obsessed with America. And to Ray I say “good luck – and work on that stutter.” Then again, Ray also told me he voted Conservative in the last election, because the Liberals needed to be “punished” for the sponsorship scandal. I asked him why not vote NDP, and he looked like he might throw up at the mere mention of the word. So I’m sure American media will welcome him with open arms. Ray’s manifesto is Brokaw’s autobiography. Since Brokaw claims boned up on politics by reading the biographies of every president, that’s what Ray’s doing. The pages you see lining the upper walls are tear-sheets of every American President in history. He’s also got multiple maps (all of the same country of course – because the rest of the world doesn’t actully matter) around his room with post-it flags on them denoting the locations of things he thinks are important, or newsworthy or whatever. Of course, I’m not sure what newsworthy means in his world – because while he may know presidents, he’s not exactly up on politics. I uttered the phrase “fiscally conservative” and he asked me to explain it. fiscal = financial, conservative = conservative. His follow-up to that? But don’t the Conservatives want to cut taxes? Oy. conservative != Conservative there champ. Then again, it’s that kind of ignorance that keeps Fox News running, so again – bully for him! So Ray spends his days sitting at his “Command Centre” (that’s what his calls his desk setup), reading his homework scripts, and flipping between Fox News, Bloomberg, MSNBC, BBC, and back to Fox News. I thought his whole obsession was just odd, and didn’t really think much about it. But now that he’s leaving, it’s going to be a fiscal issue for him. 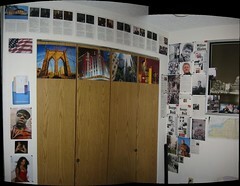 Each piece of paper on his walls (go ahead, scroll up and take a look at it again… I’ll wait… finished? moving on…) is held there with four pushpins. You can see them pretty clearly in the full-size of the closet picture – he’s used black ones on the Clinton/Bush wall. Now imagine, his 9×11 foot room is COVERED in these push-pin holes. One or two isn’t a big deal, but a whole room-worth? That’ll need to be filled and sanded before it can be painted over. And I’m sure as hell not doing it, or paying for it when it’s time for me to move out and reclaim my deposit. I’m guessing Ray might ask if he could do it himself, but he can’t operate dishwasher detergent, so I don’t think home renovation is a good step for him. I think I would’ve killed him months ago. Sweet jesus. Come to our place. We will get you drunk so you don’t have to endure him. How the HELL did he pass the “is this guy too insane to live with” test? He seemed quiet and polite, and his references all said he was really clean, quiet, and polite. Hah, hah, is he an American? I’m confused. I have a standard rider of “So, did this employee get much work done?” onto my reference-checking routine now, and the funny part is that people actually seem relieved that I’ve asked, and happy to answer, even if they wouldn’t have volunteered. So next time you check be sure to ask “Is this guy crazy?” I’ll bet people will totally open right up at that point. Hehe, no, he’s not American. He’s a 1st generation Canadian from Surrey who just wishes he were American. He’s planning on looking for work there as soon as he’s done capitalizaing on our more-affordable, high quality educaiton. And if I *ever* live with a roommate again (unlikely), I’ll totally pull out the “is this person crazy” question. That guy’s psycho. Artos suggested maybe his mom would come in and fill the holes, sand and paint. Since y’know, his parents seem to be cool with supporting everything else about his existence. You should suggest it. Except then you might have to meet his mom. That could be scary. i have most of a tub of spackle left that you can have. I feel your pain – roomates can be a burden – but it seems Ray has uppped the ante! Has anyone thought to call the psych-ward of the local hospitals to see if one their patients is missing? I love the “Command Centre” – I want one…! y’know, I only saw it live and in person for a brief few seconds, and “freak” registered before I looked away and turned my attention to more pressing things (mmm dinner) but now that I’ve had a chance to soak it in, I can offer this little tidbit: All the time I’ve spent in the US of A (including living for a year in a blood-red state) there aren’t many, if any, weirdos like this. Well, you cannot choose the country you are born in, but you can choose the one you love :). Although I don’t like the US (Oh and for the record, even though in English the word is “American” in every other language is incorrect because American and or America means people born in the Americas (Including US Citizens), so for example all Canadian born people are Americans, and so are mexicans, venezuelans etc :P).